The Jets today put one of their best defensive players on IR Saturday, as the team placed one-time Pro Bowl linebacker Jonathan Vilma on injured reserve. 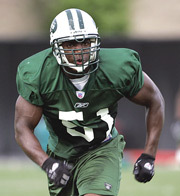 Vilma hurt his knee last week in the teams 38-31 loss to the Cincinnati Bengals. He left the game and the coaches kept him out, even after Vilma said he wanted to go back in. There was some back and forth this week, as coach Eric Mangini said that Vilma was injured, and the linebacker said that was not the case on his weekly radio spot. The good news out of the move is that according to Vilma rep Mitch Frankel, the LB will be back in 2008. “This is a not a career-threatening injury and the doctors expect a full recovery,” said Frankel. 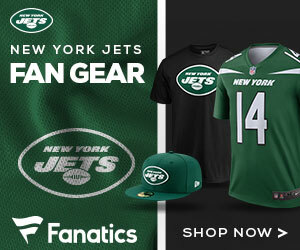 The loss of Vilma continues to put a damper on what has already been an awful season for the Jets. After going 10-6 last season and being one of the surprise teams in the AFC, the team has been just as bad in 2007, going 1-6 after seven games, with their only win over the winless Dolphins. Taking the place of Vilma in the Jets lineup will be rookie David Harris, who was the teams second-round pick out of Michigan. Harris has played well in limited time in 2007, and has recorded 24 tackles this season. He will start tomorrow’s game at home against the Bills, a team that won their first game against the Jets a few weeks back.